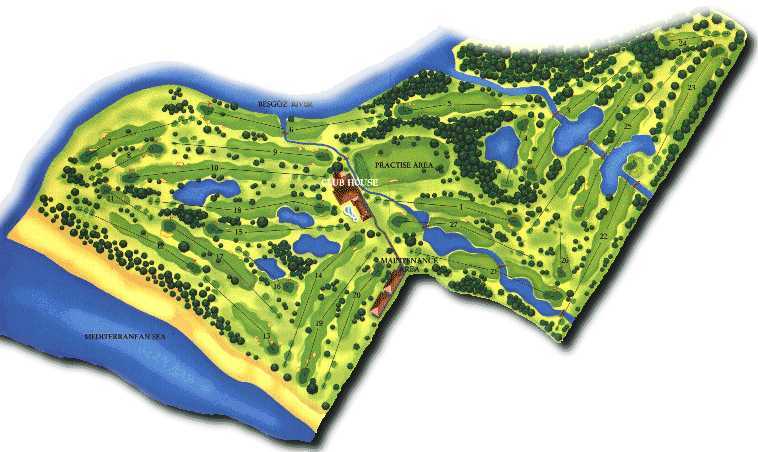 The first and only 27 hole championship Golf Course in Turkey, located at the capital of Golf: Belek. This International Championship course has been designed according to the demands of European Golfers. You can have the choice of playing 18 holes or with 3 different options of 9 hole arrangements. At Titanic Golf Belek Club, you can play golf 12 months, 365 days a year thanks to the unique climate of the Mediterranean region. The Club gives you a great opportunity for relaxation and sharing valuable friendship you would have never known without experiencing. A golfers dream vacation, which has been specifically designed for the avid and demanding european golfer. Offers you all year round golfing and a choice of three championship 9 hole layouts giving you a variety of 18 hole combination. Designed by Hawtree of England, Golf Course Architects. The intention was to keep the natural character of the area, provide dunes, lakes and rivers as much as possible. The large and widespread area of 13 acres directly placed at the mediterranean sea has been left as orginal as possible. We guide you to the most beautiful views of this area.Many tees are placed on the summits of the former dunes to give you the best look-out on the dunes, the taurus range and the mediterranean sea. The golf course is a challange for every golfer. Four different tees for international events, make it possible that every golfer, beginner, average player, advanced player and professionals- have their individual challange with hazzards in the landing area; choose the right tee for you! The golf course has a layout which provides fair conditions for first time playing.The greens are built as visible as possible to avoid blind shots. Fair and unusually good conditions are even given after extreme heavy rain falls. The sand ground of the former dunes allows the water to flow off very quickly and that the course remains playable. 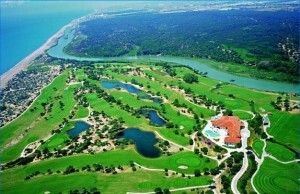 Emphasis was put on giving every 9 Hole Championship Course (The Titanic, The BELEK and INTERNATIONAL) its own character. And each hole has its own playing and landscape character to make this golf course unforgettable for you. Last but not least the TITANIC GOLF’s widespread Training Area. Is directly placed at the club house, 1 putting green, a putting-chipping green and two additional pitching greens for bunker shots and approaches up to 60 m. The driving range has got three big target greens and has more than 40 training tees, for optimal training possibility.